Fast cars in a rush. Busy people passing by. A chilly wind and slight rain. I’m in my black Hello Kitty hoodie at City Center in Washington DC. Cold and hungry on a busy day in DC, the answer to my prayers is right in front of me as I spot the peach logo of Momofuku CCDC. Momofuku CCDC is one of the restaurants of famed chef David Chang. The original Momofuku is in New York City and there are also branches in Toronto and Las Vegas. Momofuku opened up in December 2015 at CityCenter DC. The Washington DC location has a somewhat personal significance in Chef Chang’s life. He is a Northern Virginia native and his is father once owned two bistros in Washington, DC. The personal significance to Chef Chang’s childhood brought some special attention to detail in choosing the menu of this location. Momofuku CCDC ended up with some of the traditional dishes that can be found at the other Momofuku restaurants but it also got some creations exclusively made for DC. On this chilly day, I was blessed to try an array of Momofuku offerings. My meal at Momofuku started off with their famous buns. They’ve got a quite a selection of buns ranging from shitake to brisket. I got the chicken meatball buns. The chicken meatball buns are amazing. This small dish consists of two buns filled with a gigantic chicken meatball that is smothered with paprika mayo and topped with spicy jalapeños and crispy iceberg lettuce. The buns are so soft and practically melt in your mouth. They remind me of traditional siopao or steamed buns that can be found in Chinatown. These are not your classic Chinese steamed buns however because they have a special, unique twist with their fillings. The chicken meatball is super flavorful and there is a little bit of spice brought in with the paprika mayo and jalapeño. It’s spicy, savory and simply mouth watering. Right after the chicken meatball buns, the pork ramen came out. This soup was the perfect response to the slight rain that was hitting DC that day. Momofuku CCDC’s pork ramen is a food item of beauty. A feast for the eyes and a feast for the stomach,; the pork ramen is filled with pork belly, pork shoulder, poached egg and long noodle. One poke at the poached egg and the yolk comes oozing out into the warm broth and further enhancing the already flavorful soup. Along with the poached egg, there is the delicious pork meat adding to the texture of the ramen. The pork belly and pork shoulder are wonderfully tender and mix well with the long, silky noodles. This soup truly is the cure to the chilly DC day. 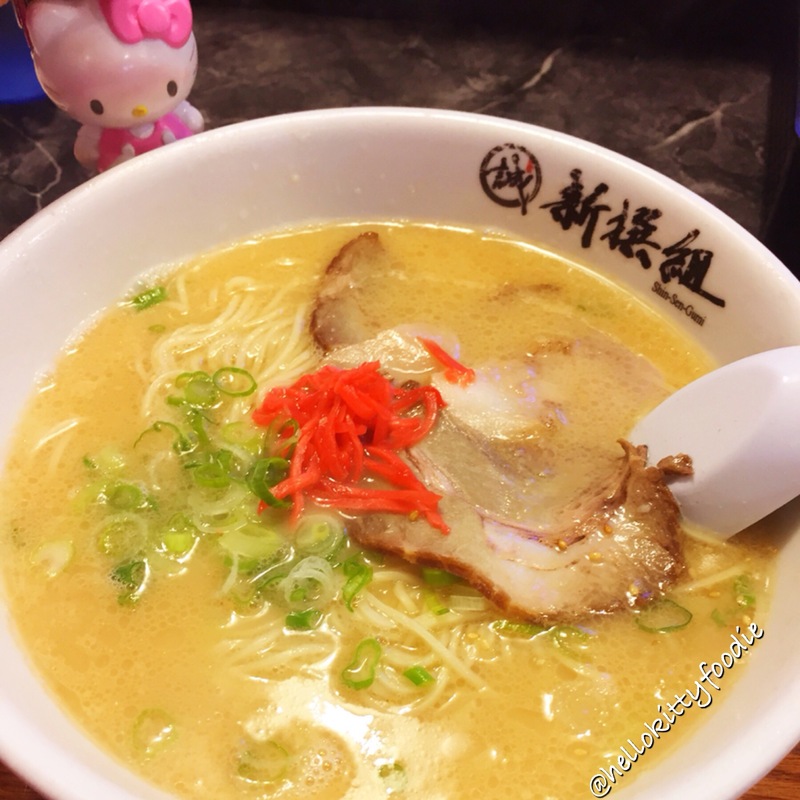 The pork ramen and buns are items that can be found at the other Momofuku restaurants but as I mentioned early in ths post, Momofuku CCDC has some special items that were created just for this branch. One of these items it their Braised Fried Chicken dish. The Briased Fried Chicken dish is not your typical fried chicken dish. Crispy fried chicken is mixed in with scallions, cabbage and shallot with a sweet sauce. It’s unlike anything I’ve ever tried. I really enjoyed how the chicken remained crispy despite being in the sauce. It’s delicious and different and I’m so happy that it’s on the Momofuku CCDC menu. It’s a dish that was inspired from one of David Chang’s favorite Chinese restaurants, the now closed Wu’s Garden in Vienna. Though Wu’s maybe closed, the braised fried chicken lives on and it’s all thanks to Momofuku CCDC. Everything I tried that chilly day in DC was perfect. I absolutely loved the chicken meatball buns and both the pork ramen and the braised fried chicken were phenomenal. For more smiles and to feel peachy like me ;), please read my Yelp review on Momofuku CCDC. It’s Decem-brrr. Ahh tis the season of cold weather! It’s time to bust out the Hello Kitty sweater, scarf and plush hat. 😉 In addition to bringing out the kawaii winter clothes though, it’s also the time of year for eating warm ramen! In the recent years, I’ve become a big ramen fan and have made my way throughout the South Bay to try out various ramen spots. I have heard so many good things about Hakata Ramen Shinsengumi and knew this ramen shop has been in Gardena for awhile but it wasn’t till one cold day that I finally came here. What I loved about Hakata Ramen Shinsengumi was that all their lunch specials come with a little appetizer. It’s always nice to enjoy a good bowl of ramen with a little extra treat! 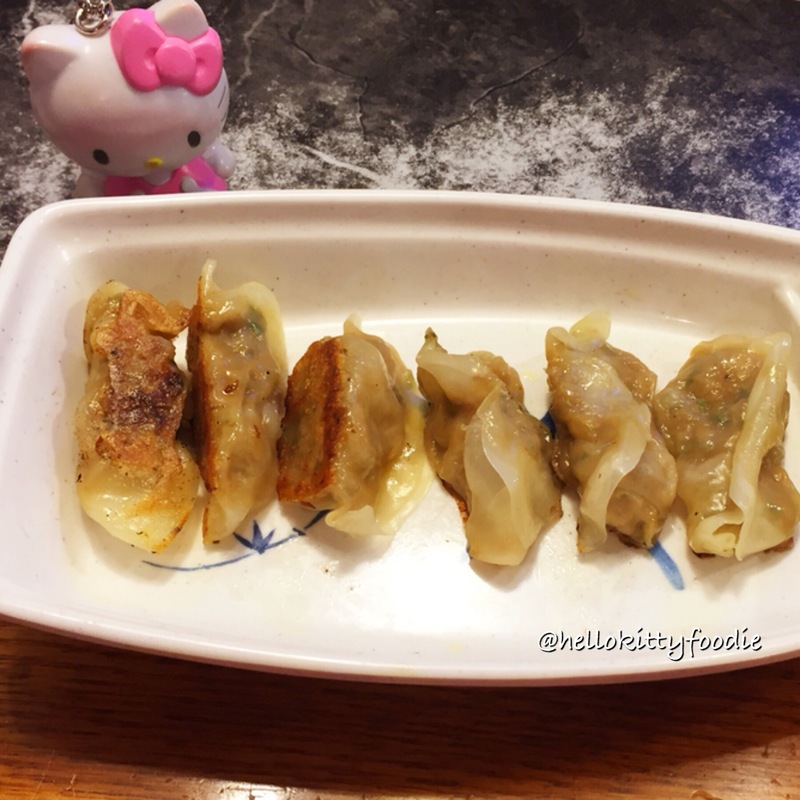 Here they have classic appetizers like gyoza. One of their lunch sets comes with six pieces of these pan fried half dumplings. It’s made fresh and served hot. 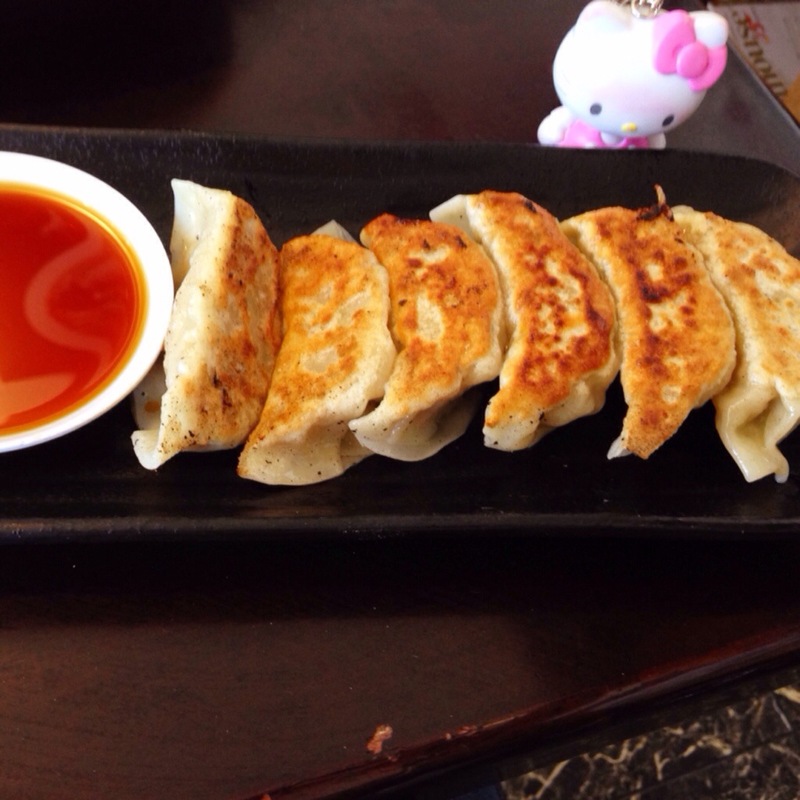 It’s small enough to fulfill your gyoza cravings but not big enough to make you full. It’s a great starter. They also offer more non-traditional appetizers such as chicken rice balls. This is the first time I’ve seen such an offering at a Japanese ramen shop but I liked it. It reminds me a lot of Chinese sticky rice. It’s a good twist on their fried rice. 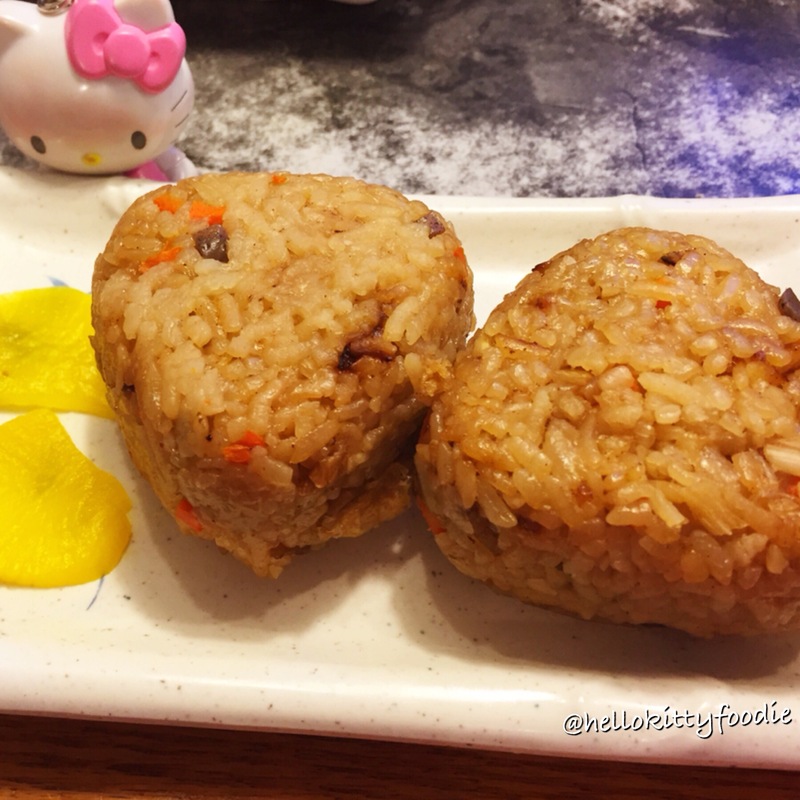 It is the fried rice but in a sticky rice ball form. 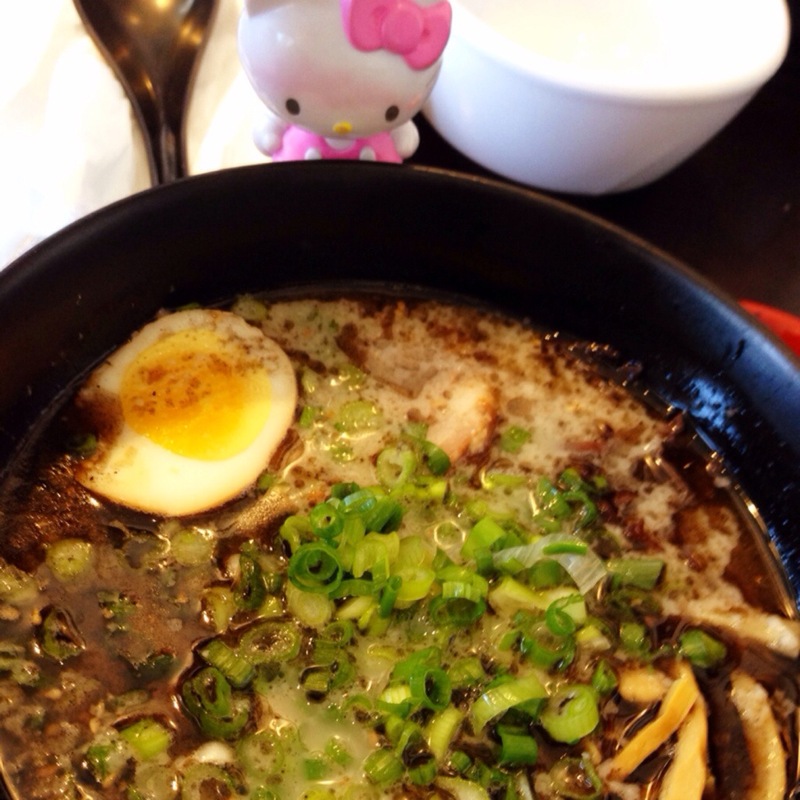 Alongside the appetizer is the main star, their ramen. The ramen is here is some of the best I’ve ever tried. You have your choice of soft, regular or hard noodles. They also offer various toppings such as bacon in addition to their regular chashu. I didn’t get any extra topping this time around because their chashu which is so tender and lean was more than enough. The broth itself is tasty. It’s not salty at all, which is very nice. The ramen is pretty big bowl and sure to make you pretty full at the end. This place is great for those brr days. Holiday smiles are sure to come when you enjoy a good bowl of ramen here along with some appetizers. It’s almost time for the “ber” months and what perfect way to prepare for those “brrrrr” err “ber” days than to find the places offering heartwarming ramen. One place offering such soup perfect for the upcoming cold days is Ko-Ryu in Torrance. 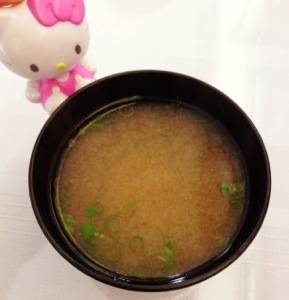 It is a nice, cozy little Japanese ramen resto that offers a creative take on the classic Japanese soup. I came here on a relatively semi-chilly Friday night. After quickly scanning the menu, a soup called the “Garlic bomb” caught my eye. I’m often a fan of flavorful garlic dishes and was intrigued with it’s name. After first sip, I can definitely say that this soup lives up to it’s name. It’s not for the garlic faint hearted. It has both deep fried and fresh chopped garlic. There’s also lots of soft, long noodles, bamboo shoot, green onions and chashu pork slices. I got extra toppings of egg and corn as weLL. 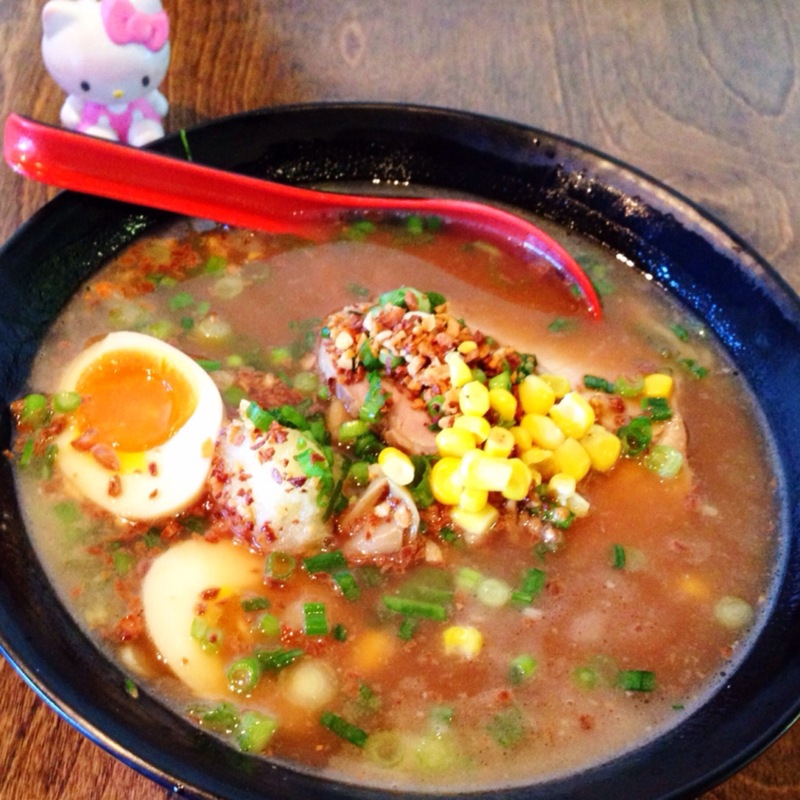 It’s a garlic power packed, flavorful ramen. Aside from the “Garlic bomb” ramen, I also had the chance to try their Torikara. 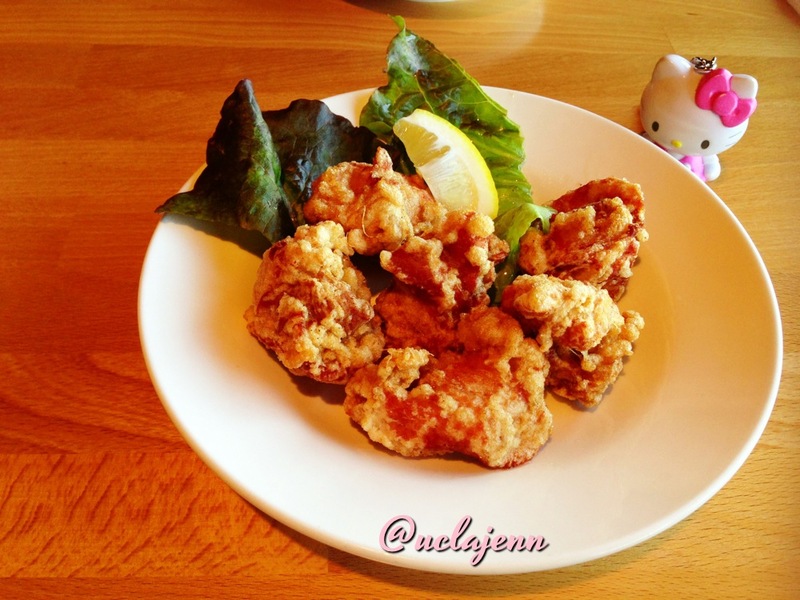 It is an interesting take on traditional Japanese karaage. The deep fried boneless chicken came marinated with sweet and sour sauce. The torikara was a good side and match to the soups. To end the night, our server treated us to some complimentary mango pudding. 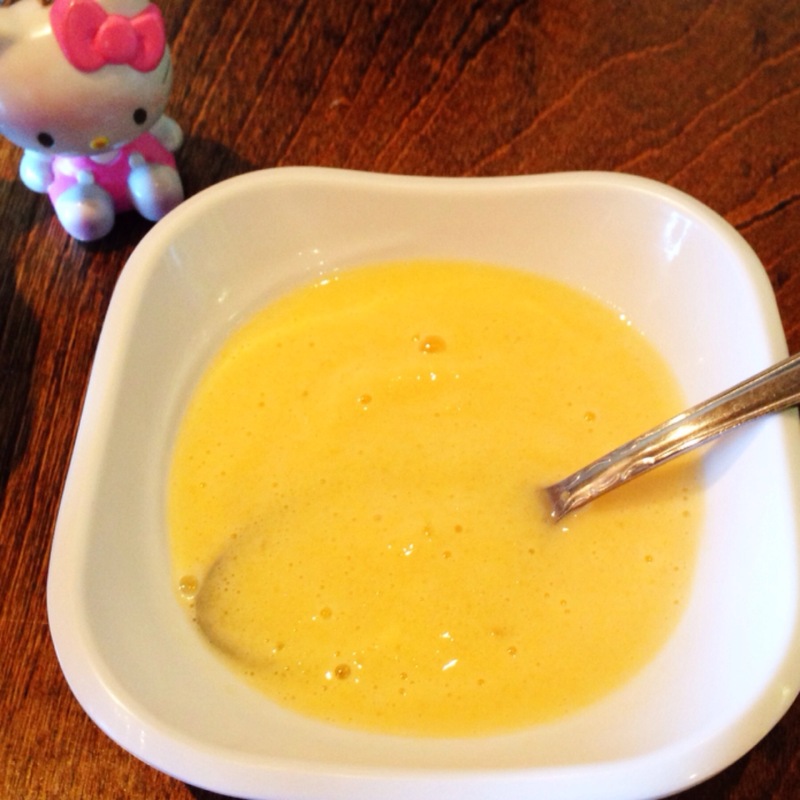 It was my first time ever to have a mango pudding like this. It’s was chilled and in liquid form. It’s a sweet and interesting take on pudding. I’m a big fan of mango and was pleased with this unique dessert. It was a perfectly cool way to end the night. Ko-Ryu is a good spot for some different and tasty food. Deliciously different ramen, unique take on karaage and free dessert, this place will be great for those upcoming “brr” days! With 8 locations in California (San Francisco, Torrance, Culver City, Westwood, Costa Mesa, Sherman Oaks, San Diego and downtown San Diego) and over 600 yelp reviews (almost a 100 from my Yelp friends) in the location nearest me, it comes as a surprise that I’ve never tried Ramen Yamadaya till today. 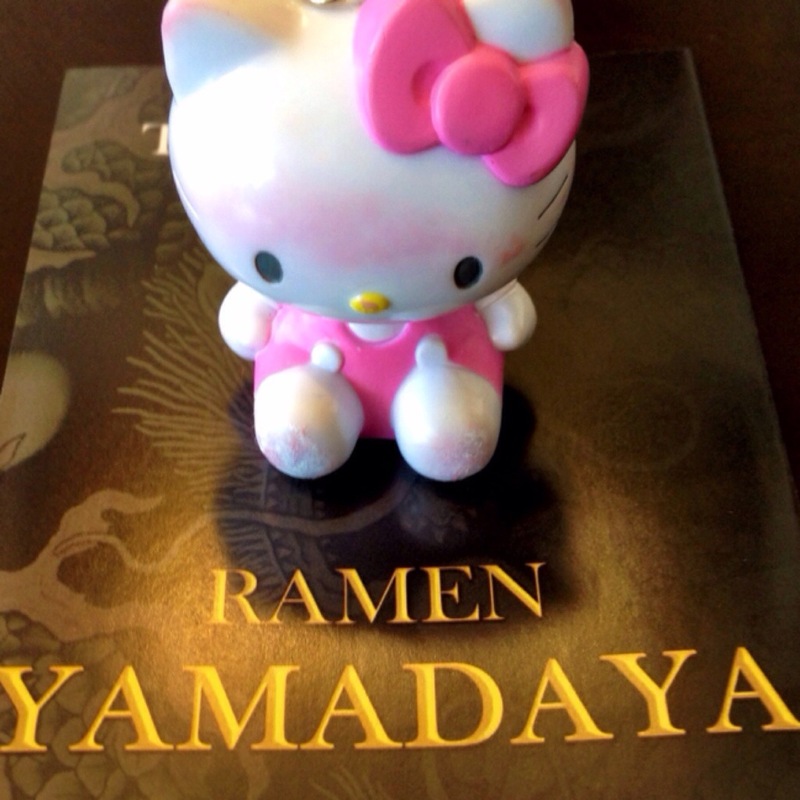 Yes, today was the day I finally tried the popular and famous Ramen Yamadaya at their Torrance location. Expectations were high as I stepped into the small little ramen shop with my friend. To start off our meal here, my friend got a plate of gyoza. Six pieces of soft dumplings were presented to us. Pan fried, the gyoza had a perfect crisp on the outside. Inside, it had a nice, flavorful juicy pork and vegetable filling. 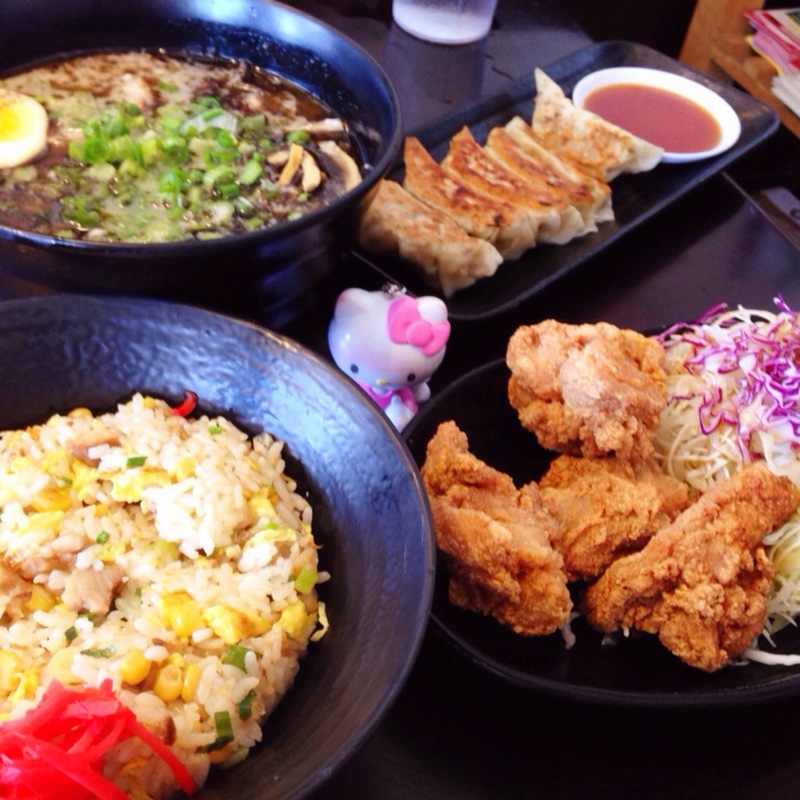 My friend and I decided to share a ramen combination with ramen, kara-age and fried rice. The kara-age came out first. 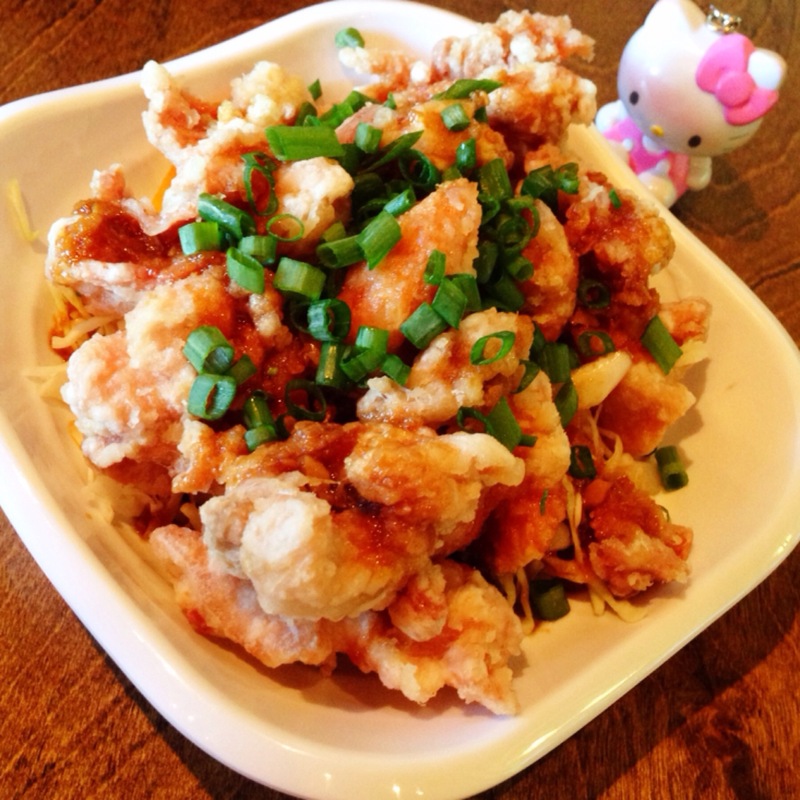 Kara-age is one of my favorite dishes and I found this place does the delicious dish justice. Hot, fresh and crispy, the chicken was wonderful. It was seasoned perfectly and fried to golden perfection. It came with some very tasty salad. The salad was like a slaw and consisted of shredded lettuce topped with sweet dressing. Up next for our meal was the fried rice. The fried rice was excellent and reminded me of some my favorite fried rice dishes that I’ve only found at Hawaiian resturants. 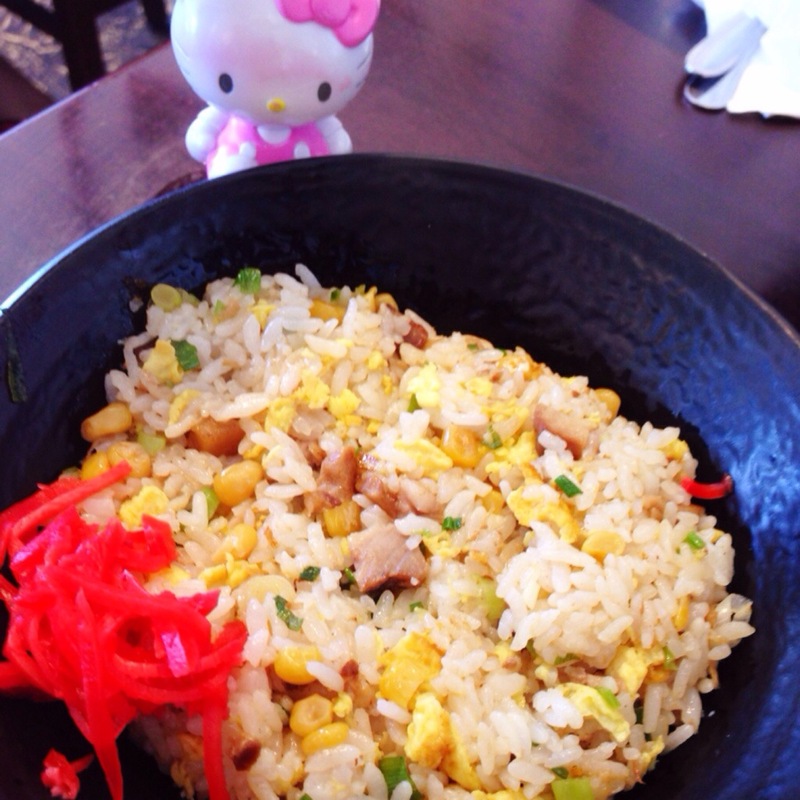 Their fried rice here had lots of little pieces of egg, chashu meat and corn! It was so flavorful and perfect with the gyoza and kara-age. Last but not least for us was the ramen. We got the tokontsu kotteri. It was rich and fatty ramen with black garlic oil. The pork broth was filled with their original thin noodle, tender slices of pork meat, one marinated egg with with a half baked yolk and sprinkles of scallion. We also got a side of fresh garlic on the side that we pressed and added to the broth. This ramen is one of the best that I’ve ever tried. 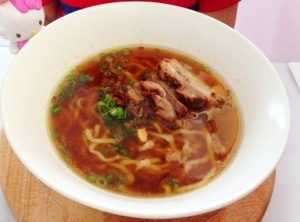 The broth comes from 20 hours of boiling with pork bone. Thick in cosnistency, rich and creamy and with good garlic flavor all throughout, the broth was excellent. The toppings were like icing on the cake, it added an extra bit of happiness to the already flavorful soup base. I was very happy with Ramen Yamadaya. There were plenty of smiles after this meal. For more smiles, please see my recent Yelp review on Ramen Yamadaya. 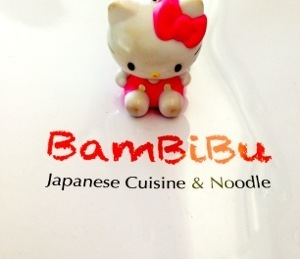 BamBiBu is a nice new little spot in Redondo Beach. I found this place thanks to Yelp and was excited to try it out. I’ve been on a ramen run for the longest time and when I heard about his new spot, I had to try it. Walking in, I took notice right away how cute this place was. One wall is filed with origami of different sizes, shapes and colors! It adds such a neat and happy vibe to this restaurant! When my friend and I sat down we were served our menus, drinks and the cutest chopsticks ever. 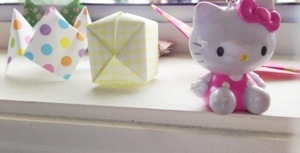 The chopsticks were wrapped in origami paper! It’s a neat concept! 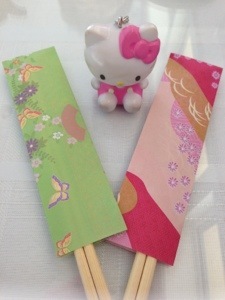 The chopsticks match their origami decorations. The menu here is comprised of starters (edamame, koro koro french fries and seaweed salad), rice sets (chicken teriyaki, karaage, tonkatsu and chicken katsu), ramen (tonkotsu, miso, shoyu, tsukemen), sushi and gyoza. We decided to start our meal with gyoza. We got the regular gyoza which is filled with ground Berkshire pork, cabbage, brown onion, green onion, chives and special homemade seasoning. The gyoza was freshly made and fried. It was soft and very tasty! I find it neat and interesting that the pork used for their gyoza filling is imported from Canada! We dipped our gyoza in vinegar and chili oil. The chili oil added quite a kick to these dumplings because it was spicy! The set comes with white rice but I chose to substitute the white rice with chashu meshi. 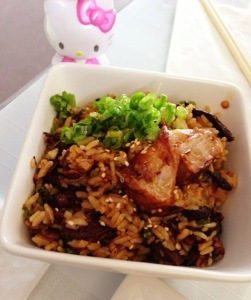 The flavored rice was filled with tender pieces of sweet chashu. It had a distinct taste of soy sauce. This rice was very tasty. The miso soup and the chashu meshi is already a lot of food but the Karaage set has even more food! 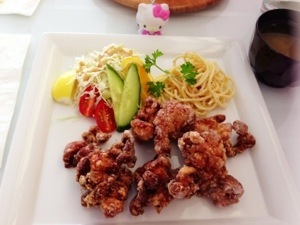 There were several pieces of Japanese style fried chicken marinated in ginger, shoyu and garlic. On the side were a coleslaw type salad and pasta salad. 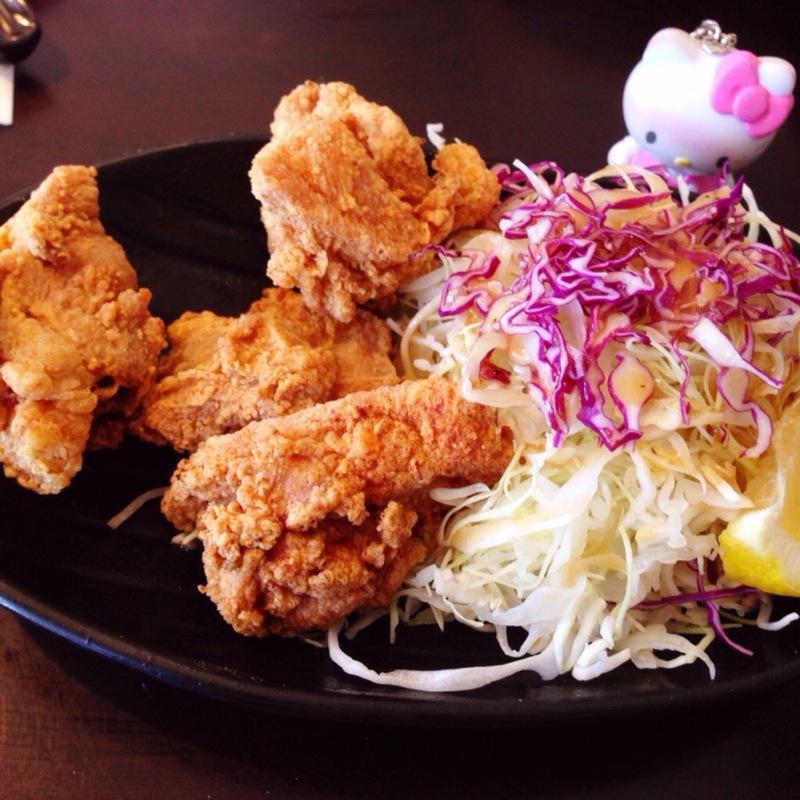 The crispy chicken matched well with the yummy chashu meshi as well as the side salads. I liked how the chicken was crispy on the outside but soft in the inside. Aside from the karaage set, I got to try a little bit of my friend’s shoyu ramen. I liked that it was chicken broth. It also had tender chashu pork. The ramen was filled with thick noodles. Overall I liked this little new ramen spot in Redondo Beach. 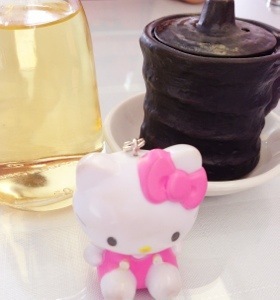 It has a cute and clean atmosphere, their offerings are neatly presented and their food is tasty! For more smiles, please see my recent yelp review on BamBiBu. I’m on the quest of finding even more good ramen places in the South Bay! After reading some of the Yelp reviews and seeing this place feature in the LA times food blog, I decided I needed to try this place out. I came here during happy hour time! Both the regular menu and happy hour menu are filled with lots of good treats and yummy deals! My friend and I each got the half white miso ramen. The white miso is one of the more popular items according to Yelp. (You can either get a whole size or half size but we chose half in order to save room for appetizers ;). My friend and I had to get an order of gyoza! It was a must try because it was a special mention in the LA times food blog! They are soft and filled with delcious ground meat. The best appetizer we ordered however was the fried chicken! These were served hot and crispy. It was super tasty! I love how they were flavorful without being salty. I know I will be ordering this again on a future trip! Yay to another good spot in the South Bay! 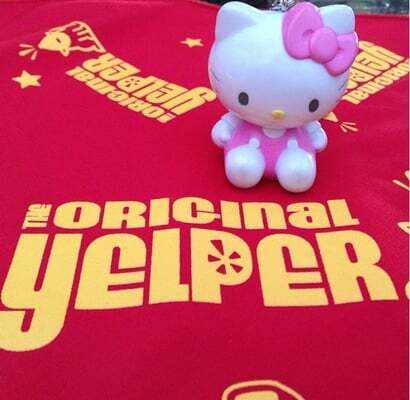 Yelp and the LA times food blog never fails to point this foodie in the right direction :). 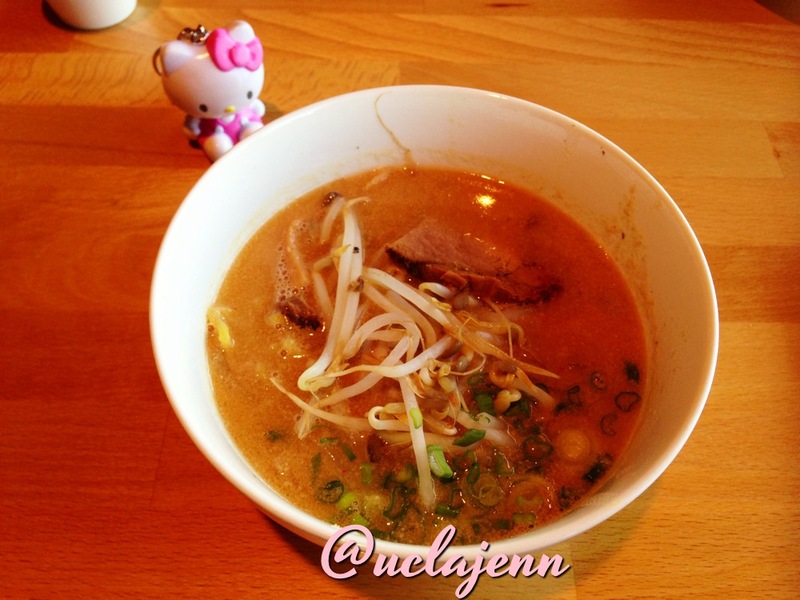 For more smiles, please see my recent yelp review on Ramen Hayatemaru.